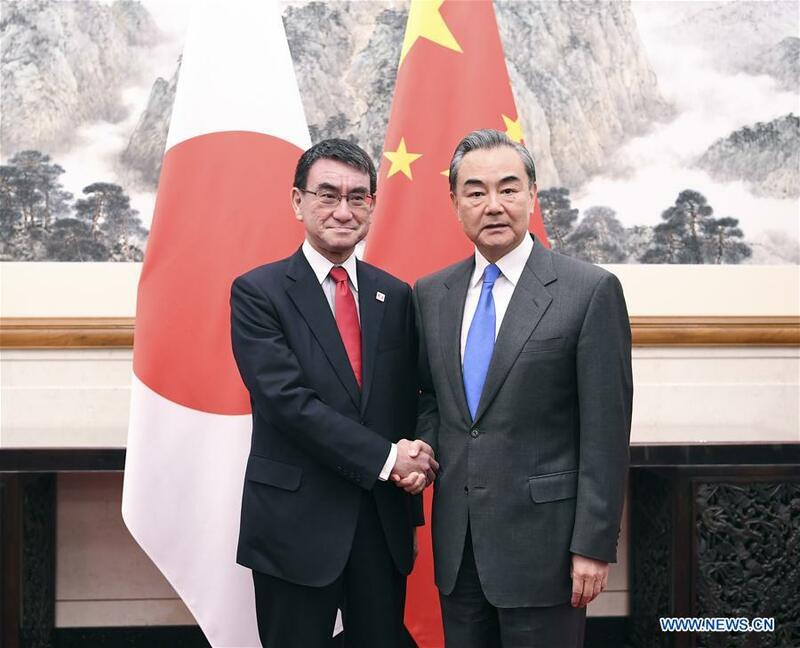 BEIJING, April 15 (Xinhua) -- State Councilor and Foreign Minister Wang Yi held talks with Japanese Foreign Minister Taro Kono in Beijing Monday. While noting the improvement process of China-Japan relations is still in its initial stage, Wang said that under the guidance of the principles affirmed in the four China-Japan political documents and important consensus reached by leaders of the two countries, it's necessary for both sides to strengthen exchanges at all levels and continuously enhance political mutual trust to ensure bilateral ties will always run on the right track. China welcomes the Japanese side to send a high-level delegation to attend the second Belt and Road Forum for International Cooperation to be held in Beijing in late April, Wang said. For his part, Taro Kono said the Japanese side will adhere to and abide by the four China-Japan political documents and take concrete actions to implement the political consensus of being cooperative partners rather than make threats to each other. They also agreed to resume the travel study program for Japanese students to China.